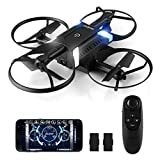 · & #x1F680; (Folding Drone with Protective Rings): This RC Quadcopter with Smart Foldable Design, can be halved after folding, allows you to travel light, enjoy the fun of flying. The 4 protective rings can effectively protect the blades from damage caused by collision during flight. It will be the safest drone for children, adults. · & #x1F680; (Altitude Maintenance & Emergency Landing): This drone camera with altitude retention mode, you can accurately lock height and location, move stably and capture videos or photos from any shooting angle, making the experience very easy and convenient. There is an emergency landing function to avoid collisions with other things. · & #x1F680; (Remote Control Sensing Severity): You just need to gently balance the remote control, you can control the flight direction of the RC drone, so that beginners can start more easily and do not worry about driving problems in beginners. · & #x1F680; (One key return and headless mode): One-key return function allows the FPV drone to return automatically without losing the drone. The headless mode option can make the front side of the drone the same as the remote, making it easier to fly to your destination.